Crazy Little Thing Called Love…(Valentine’s Gift Guide #2) – What is Perfect? After a busy morning of homeschool co-op, all 3 of my kiddos are sleeping! (Miracle of miracles!) 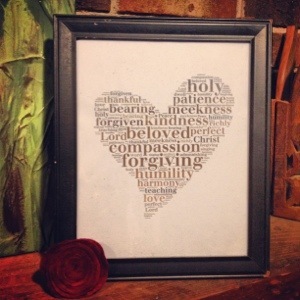 So, I’m taking this lovely and quiet opportunity to share my next diy Valentine’s Day gift idea with you! Do you love this as much as I do? I actually made this just to display at my home, so it’s not exactly something that I made for my husband. But, it’s something that would make a perfect gift for someone you love! The thing that I love about this is how personalized you can make it. Think about your love. What do you love about them? What makes them who they are? Getting to show someone all the things you love about them, and in such a sweet way! Yeah, that makes for a great gift! Visit http://www.tagxedo.com to get started on this gift. Hit the create tab and add all the words that you want to be included in your word cloud (which is what this thing is technically called, I think!). Use the characteristics you love about your spouse or significant other, use words from a Bible verse, or whatever words you want! You can put the words in different shapes (there are a few different heart shapes, and tons of other shapes! ), change the color, alternate the word order, and ultimately keep switching things around until you get it just how you like it! One thing to mention, I was never able to print it out looking exactly like it looked on my computer screen. The colors were always different. I don’t know if it was just my printer or not, but just wanted you to know. After you print it out, pop it into a cute frame (remember, shop your home for unused frames or hit up your local thrift shop to keep this inexpensive), and voila! A sweet, personalized and inexpensive gift for the one you love! That’s it for idea #2! Maybe this will be something perfect for you to make for your love this Valentine’s Day! And, don’t forget to head over to my little Valentine’s Day giveaway here for your chance to win a sweet little thing from me! The giveaway runs through Thursday night, so check it out for the details! Previous Post Valentine’s Day Giveaway! !